Alex Ross is the legendary comic book artist who draws, paints and sculpts legends – superheroes, heroines and villains from the dual galaxies of DC Comics and Marvel Comics. It’s been a lifelong passion. “I’ve known since I was 3 or 4 years old, as soon as I discovered Spider-Man, that that’s what I wanted to do,” he told Chicago Tonight. Ross grew up in Lubbock, Texas, but came to Chicago at age 17 to study where his mother, a successful illustrator, had studied: the American Academy of Art. Ross is best known for his incredibly detailed, hand-painted cover art and for reimagining and updating classic heroes. His major works include the series “Kingdom Come” (1996) – a futuristic view of the DC Universe that imagines Superman’s return from retirement – and “Mythology” (2003) his homage to the entire DC Universe, from Batman, Wonder Woman and the entirety of Justice League heroes and villains. His number one superhero? “I’ve had my favorites over time, and Captain America is definitely very high on that list. He’d probably be my current favorite, but I’ve migrated from loving Superman to drawing Captain America with a lot of the same enthusiasm – and for me it’s also the exact same friend of mine that posed for both of them,” he said. And when we asked what he thinks of the glut of superhero movies in recent years? “You used the word ‘glut,’” he laughed. Ross’ new book “Marvelocity” features his extravagant artwork for the Marvel Comics universe. Spider-Man, Black Panther, Guardians of the Galaxy, the Fantastic Four and many more are brought to life in eye-opening detail. He also features lesser-known characters such as Spider-Woman and the reimagined heroes who populate Universe X. Ross first tackled the world of Marvel in “Marvels,” a series from 1994. 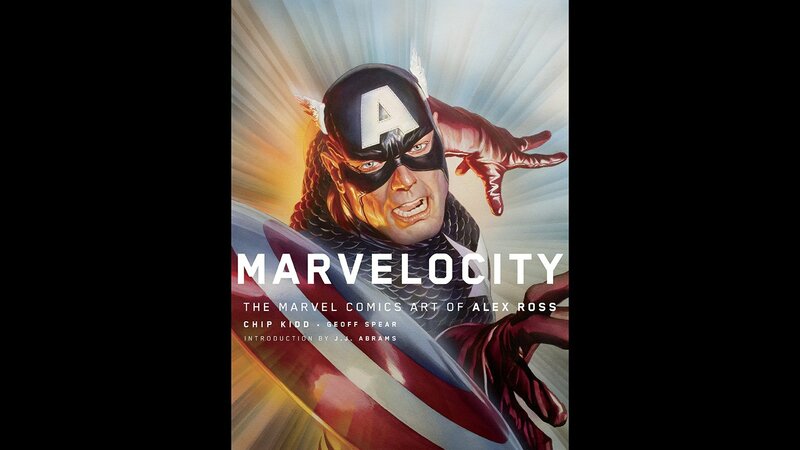 Alex Ross and “Marvelocity” co-author Chip Kidd participate in a discussion in Chicago on Saturday, Oct. 27 as part of the Chicago Humanities Festival. Find more details about the event here.